Schaeffler honored its best suppliers of production materials in Herzogenaurach. 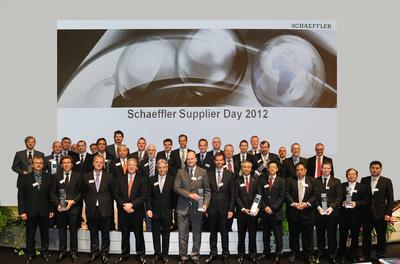 Quality, reliability, competitive cost structures, service, innovation and global presence are all aspects in which the 16 suppliers from 8 countries who received the 2012 Schaeffler Supplier Award demonstrate excellence. The highest growth rates in the coming years are expected in regions such as Asia and North America and not in Europe. This means that the same high standards apply in all locations in all regions. Coordinated, uniform processes, transparency regarding information and material flows, highly-qualified employees and extensive training at all locations in all regions is required to ensure we provide the same high quality and the best service all over the world. The objective according to Geissinger is to increase added value locally. This means Schaeffler will increase the involvement of local suppliers in future and integrate them into its global network. A reliable network of suppliers coordinated both locally and globally with optimized processes is an important success factor. Suppliers must be prepared for this according to Geissinger, and they must be able to supply purchased parts, raw materials, and services at the required quality and in the required time frame at competitive prices in all regions. The Schaeffler Supplier Awards for manufacturing materials are presented every two years – alternately with the “Premium Supplier Awards” as part of the purchasing cooperation with Continental AG.